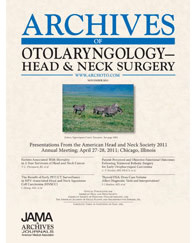 The study was reported in the November issue of the Archives of Otolaryngology – Head and Neck Surgery. Amy Y. Chen, MD, MPH, professor in the Department of Otolaryngology – Head & Neck Cancer at Emory University, and colleagues from the American Cancer Society, examined death rates of patients with oral cavity (mouth) and pharyngeal (throat) cancer in 26 states between 1993-2007 and compared the level of education among those patients. Data showed that from 1993 to 2007, overall mortality rates for patients with oral cavity and pharynx cancer decreased among black and white men and women regardless of race or ethnicity; however, mortality rates among white men have stabilized since 1999. Mortality rates decreased significantly among men and women with more than 12 years of education, whereas rates increased among white men with less than 12 years of education. The researchers also looked at mortality rates for patients with cancers of the oral cavity and pharynx that were related to HPV. Those patients with cancers that were not associated with HPV had significant decreases in mortality. Mortality rates for cancer related to HPV decreased only among black men with at least 12 years of education but increased among white men, except for those with more than 12 years of education. The authors conclude that the overall difference in mortality trends may reflect the changing prevalence of smoking and sexual behaviors among populations of different educational attainment. Chen also is a researcher for Health Services Research, American Cancer Society. Other researchers involved in the study include Carol DeSantis and Ahmedin Jemal, Surveillance Research, American Cancer Society.